Ever hear of tea and crumpets? At our “Lady’s Tea” cooking class at The Lark Inn we had tea and made wonderful crumpets. They involve a yeast batter and while they are not particularly difficult, they do involve a couple of extra steps to produce these delectable treats! Let’s make crumpets! Sift together the flours and cream of tartar into a large bowl. Mix the dry yeast, mixing the granules and the sugar with 3/4 cup lukewarm water and let stand until foamy, 5 to 10 minutes. Stir in the remaining lukewarm water. and let stand in a warm spot until the batter rises and then falls, about 45 minutes to 1 hour. Add the salt and beat the batter for about 1 minute. Then cover the bowl and let stand in a warm spot for 15 to 20 minutes, so the batter can rest. Dissolve the baking soda in the lukewarm milk. Then gently stir it into the batter. The batter should not be too stiff or your crumpets will be “blind” — without holes — so it is best to test one before cooking the whole batch. Heat a very clean griddle or frying pan over moderately low heat for about 3 minutes until very hot. Put a well-greased crumpet ring on the griddle. Spoon or pour 1/3 cup of the batter into the ring. The amount of batter will depend on the size of your crumpet ring. As soon as the batter is poured into the ring, it should begin to form holes. If holes do not form, add a little more lukewarm water, a tablespoon at a time, to the batter in the bowl and try again. 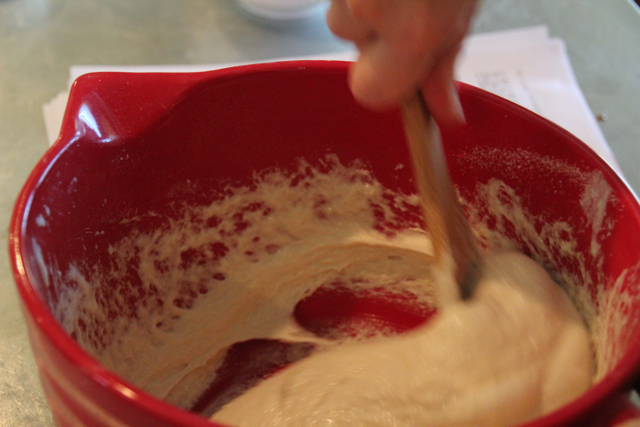 If the batter is too thin and runs out under the ring, gently work in a little more all-purpose flour and try again. 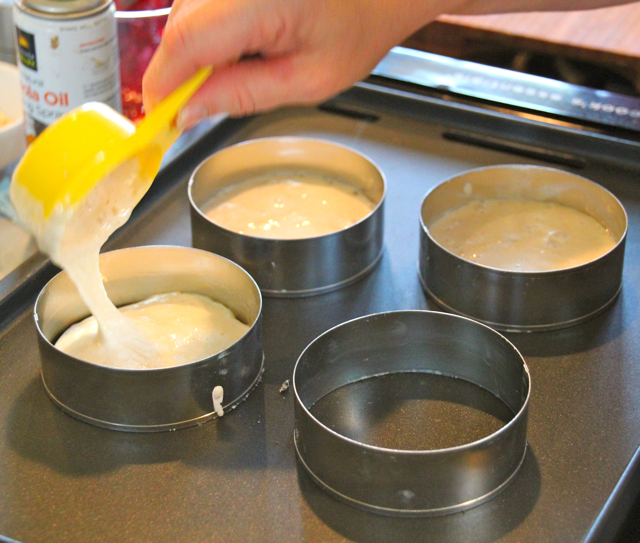 Once the batter is the proper consistency, continue with the remaining batter, cooking the crumpets in batches, three or four at a time. 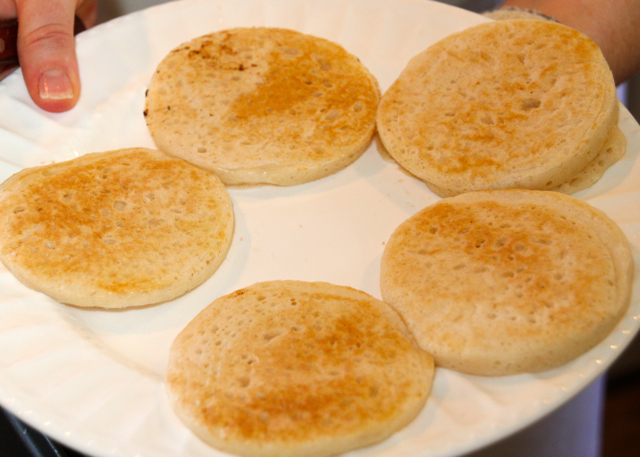 As soon as the top surface is set and covered with holes, 7 to 8 minutes, the crumpet is ready to flip over. To flip the crumpet, remove the ring with a towel or tongs, then turn the crumpet carefully with a spatula. The top, cooked side should be chestnut brown. Cook the second, holey side of the crumpet for 2 to 3 minutes, or until pale golden. The crumpet should be about 3/4 inch thick. Remove the crumpet from the griddle. Grease the crumpet rings well after each use. The only even slightly tricky part of the actual crumpet-making is that you have to remember to butter the crumpet rings (or tuna cans or whatever) very well inside and on the edges between each batch. When you’re ready to turn the crumpets, though the recipe suggests using tongs, it’s just as easy to use a flat knife to nudge the rings up and off the crumpets as soon as the outsides are solid. That way you can set them aside to cool so you can handle them as soon as the crumpets presently in the skillet or on the griddle are done. Pour a nice cup of tea and enjoy your crumpets . . . slathered with butter and jam! CHECK OUR WEBSITE for availability of room at our next cooking class or availability of our get-a-way guesthouses in the Flint Hills of Kansas. This entry was posted on May 1, 2012, 11:17 am and is filed under Cooking and Baking. You can follow any responses to this entry through RSS 2.0. You can leave a response, or trackback from your own site. loss by breaking up fat deposits faster.